Today people throughout many countries of the world will take time to remember their war veterans. In the U.S. it’s called Veteran’s Day. In other countries it’s called Armistice Day or Remembrance Day. 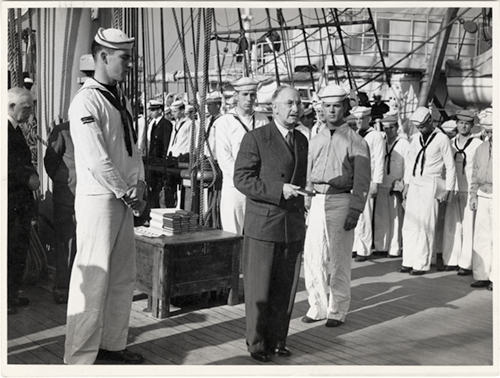 The Gideons International first began offering God’s Word to the military in 1941. Last year, Gideons distributed more than one-million free Service Testaments. Also, any service member who asks for a New Testament receives one. These Service Testaments are provided through offerings from churches and concerned Christians as well as donations received through Gideon Tribute Cards. It is a double honor to have served in the military of the United States to protect this nation’s freedom but now to serve in the Army of the Lord. I thank God for His protection shown on all who serve in the military service in whatever country that they serve today. I also thank all who serve the Lord in His Army today for their enthusiastic service to the Lord in placement of Scripture, witnessing to the lost, and direct support of the Gideons International funds development activities. Thank you for your comment and your service in the Navy and in the Gideons, Michael. Has your testimony ever been published in The Gideon magazine? If not, may we edit and publish the text shared on your blog link? Thank you and God bless. I don’t believe my testimony has been published in any magazine other than the Hoosier Gideon. You have my permission to use it in any manner you like to the Glory of God. the Bulge. He shared that although he was very “anti-God” up to that point in his life, he cried out to Him and God saved him both physically and spiritually through the Military Testament given to him by The Gideons. I am grateful to God for this ministry!